Trustworthy generation of public random numbers is necessary for the security of a number of cryptographic applications. It was suggested to use the inherent unpredictability of blockchains as a source of public randomness. Entropy from the Bitcoin blockchain in particular has been used in lotteries and has been suggested for a number of other applications ranging from smart contracts to election auditing. In this Arcticle, we analyse this idea and show how an adversary could manipulate these random numbers, even with limited computational power and financial budget. Pierrot, C.A, & Wesolowski, B.P.C. (2017). 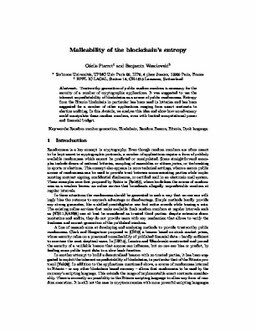 Malleability of the blockchain’s entropy. Cryptography and Communications.